The type 1 diabetes diet and health goals recommended by the ADA for children are stated in the 2015 ADA Guidelines. Of particular concern is this statement: "An A1C goal of 7.5% is recommended across all pediatric age-groups." This correlates to an average blood sugar of 170 mg/dL. The ADA neglects to mention and perhaps doesn't know that long term complications associated with hyperglycemia are possible in children before puberty. Children do get diabetic complications from the ADA type 1 diabetes diet. In adults, damage from high blood sugar begins at glucose levels as low as 120 mg/dL, so it's no wonder children with type 1 diabetes show signs of diabetic damage. Parents who have trouble reaching the target HbA1c for their children should know this failure is NOT their fault. Instead, the fault is with the ADA, and a smaller extent, the medical professionals giving out illogical and damaging directions about the most effective type 1 diabetes diet to unsuspecting parents. These trusted experts tell parents to control blood sugar, but also tell them that children must eat carbohydrates in order to grow. It's some kind of crazy to push a high carb type 1 diabetes diet because endocrinologists and dietitians KNOW that carbohydrates raise blood glucose. This is why patients have to count carbs so they can bolus the correct amount of insulin. But they continue to tell parents to feed their type 1 children carbohydrates, even though children can get the nutrition they need from protein and fat sources. Carbohydrates are not essential to growth or well being, and in fact, a high carb diet slows growth. Dietitians know that carbs are not essential because it is stated, clear as day in the Dietary Reference Intakes, their guiding document (see page 275 under Clinical Effects of Inadequate Intake). Here's the direct quote "The lower limit of dietary carbohydrate compatible with life apparently is zero, provided that adequate amounts of protein and fat are consumed." Carbohydrate﻿ intake is directly correlated to higher HbA1c levels. HbA1c levels are correlated to slowed growth, as this measure is linked to lower levels of IGFBP-3, a marker for growth hormone. HbA1c tests are markers for poor glycemic control and reduced amounts of IGF-1 another growth hormone. In other words, high blood sugar levels (which are reflected in HbA1c tests) impair growth in children with type 1 diabetes. What drives blood sugar and HbA1c results higher? Carbohydrate intake. Ergo, carbohydrate slows growth. The logical response to this would be to minimize carbohydrate intake to minimize HbA1c levels. But the ADA tells parents that children must eat carbohydrates in order to grow. You can see now that the result of following this bad advice results in worsened blood sugar control. Bottom line is that it's literally impossible for parents following the ADA/medical professional direction on carbohydrate intake to attain normal blood sugars in their children. The ADA diabetes diet is the source of the blood sugar roller coaster with which parents of type 1 children struggle, and it is happening because they’ve been told that carbs are essential for growth. And it gets worse. For those parents with small children following the high carb intake directions, the journey will become more difficult as puberty arrives, as hormone fluctuations during puberty naturally drive up blood sugars and thus HbA1c levels during that time. It seems illogical that the ADA and the local endocrinologist and dietitian would give bad directions, but this is true all over the country. Advising parents that a type 1 diabetes diet has to include carbs for growth is a major factor in the blood sugar roller coaster which results in death-defying low blood sugar and damaging periods of high blood sugar. Fortunately, there's a solution to the problem. Some parents have gotten wise and ignored the bad advice they received to give carbohydrates to their children. Instead, they plan meals around meats/poultry/fish, green vegetables and natural fats. Meals and desserts are made from low carb, tasty ingredients. And in those families, T1 is well controlled, HbA1c tests regularly hit the normal and coveted 4-5 range, and hypoglycemia is nonexistent. These families, by looking at real results, have gotten off the blood sugar roller coaster. They report that once blood sugars came down, their children started growing, both parents and children were less stressed, and finally there was hope that long term complications could be avoided. RD Dikeman and his son David are one example. RD is a type 1 parent who has found that giving up the carb rule has resulted in his son David attaining an HbA1c in the 4 range. David is a type 1 and routinely has normal blood sugars. I encouraged any type 1 parent, or type 1 diabetic for that matter who is struggling with controlling blood sugar to view RD and David Dikeman’s videos on Youtube. Start with this one, then see this one, and then this one. It will take courage to follow a new path to a LCHF type 1 diabetes diet. You may be bullied by your endocrinologist and/or dietitian about your child's carb intake. Stand your ground! They may even threaten you, even though this would be grounds for malpractice. Remember that you are the customer and you can choose a new doctor. Find a medical professional who will support your choices, and approve the real positive results you will gain from making the switch to this new way of eating. The resources below will provide more information to help make the shift. 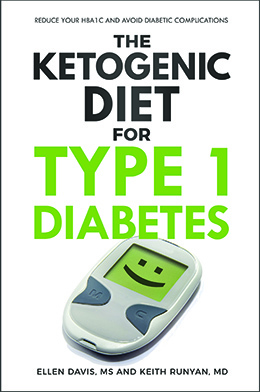 Dr. Keith Runyan and I wrote the Ketogenic Diet for Type 1 Diabetes to help families and individuals transition to a low carb, high fat ketogenic diet. We hope it will help people live long happy lives free from complications. Dr. Bernstein's Diabetes University: Dr. Bernstein is a bona fide hero and has forged the way for a low carb diet for type 1 diabetics. He has several books.. see the sidebar. Gabriel's Diabetic Kitchen: Gabriel was diagnosed recently with Type 1, and now advocates for a low carb, high fat diet for other kids. Hanna Boethius: Hanna learned through hard experience that the advice she received from the "experts" worsened her blood sugar control. She went low carb and went back to school so she could help others. 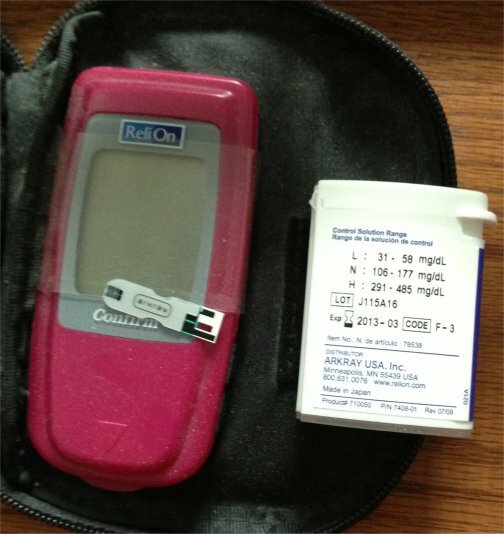 She offers coaching services for other type 1 diabetics. Dr. Bernstein talks about What Parents of T1 Children Need to Know: Excellent video on the issues around the problems with the ADA recommendations and what to do instead. The Noakes Foundation: This South African organization was founded by Professor Tim Noakes to promote the use of low carb, high fat diets for treating diabetes and other diseases. He has taken a lot of heat in his country for his views, and I salute him for his courage. My hope is that the information about choices for a type 1 diabetes diet shared here will help all not only parents of young children, but all type 1 diabetics. There is no reason to fear long term complications. A solution is just a different meal choice away.